Cobh Ramblers twice came from behind to claim a point against Limerick who will rue missed chances after they were held to a 2-2 draw in the SSE Airtricity Under-17 Southern Elite Division at UL on Sunday afternoon. 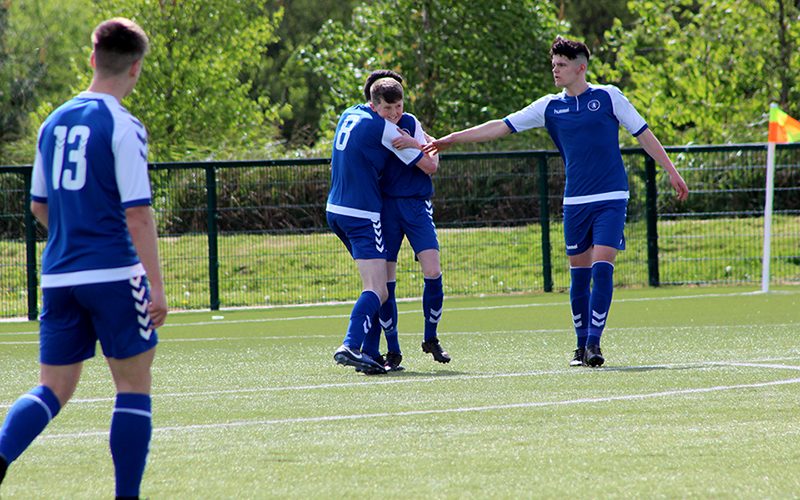 The young Blues were deservedly ahead early on when Darragh Lowth converted from the spot, and they were unlucky not to be in a more comfortable position before the break after Michael Conlon struck the underside of the woodwork. The former Creeves Celtic forward was presented with easier opportunities after half-time but in two one-on-ones he was denied brilliantly by Cobh ‘keeper Arthur Nganou. And from there Cobh saw a way back into the game, with Jaze Kabia firing just wide before he crashed a shot off the crossbar. Those warning signs were not heeded and Ramblers were level on 77 minutes when substitute Dylan Walls curled a superb shot to the top corner. Limerick were back in front seven minutes from time when substitute Jack Joyce fired in but Cobh replied immediately through Kabia, and it was he who almost snatched a winner in injury-time when his low shot came back off the upright. Limerick started on the front foot and they forced the first save of the day on nine minutes when Conlon struck from distance and Nganou pushed the ball behind, with Tomás O’Connor heading over the resulting corner after getting free in the box. 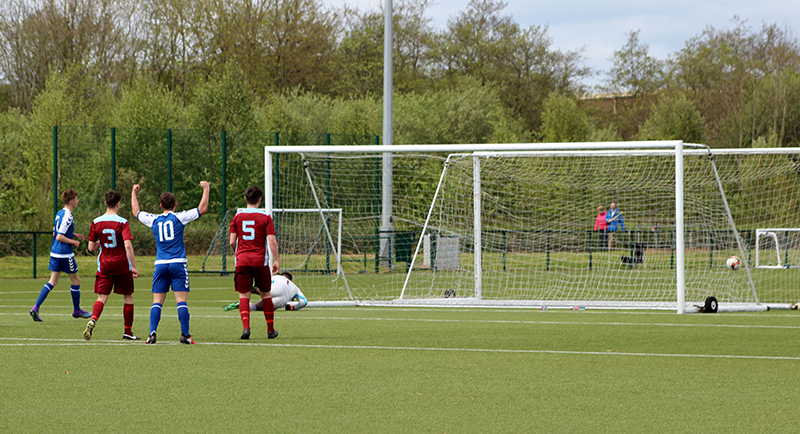 Darragh Lowth coolly converts from the spot as Bradley McNamara (10) celebrates. The young Shannonsiders were ahead by the quarter-hour when Seán Hayes fouled Conlon in the box and up stood Lowth who coolly converted to the bottom corner as he sent the ‘keeper the wrong way. Derek McCarthy’s players continued to make all the running and on 26 minutes Liam O’Sullivan drove over after the ball fell to him in space 25-yards out. Cobh then threatened as they shot narrowly off target, before Bradley McNamara saw his strike well held by Nganou. On 32 minutes, O’Sullivan met Lowth’s corner with a downward header but again the ‘keeper saved. Nganou was beaten moments later when Conlon turned on the edge of the box and sent a dipping shot which struck the underside of the crossbar and bounced out. Cobh could have levelled before the break but Michael Garrihy got behind Jack Ford’s drive. Limerick should have doubled their lead seconds after the interval when Conlon got free on goal but he was denied by an impressive save, and Nganou proved equal to the task again on 49 minutes in another one-on-one with Limerick’s No9. McNamara then fed Conlon who got it past the ‘keeper but from a tight angle the in-rushing Lowth sent the loose ball across the face of goal. Those misses gave Cobh encouragement and they went within inches of equalising on the hour when Kabia’s snap-shot in the box whistled just past the post. 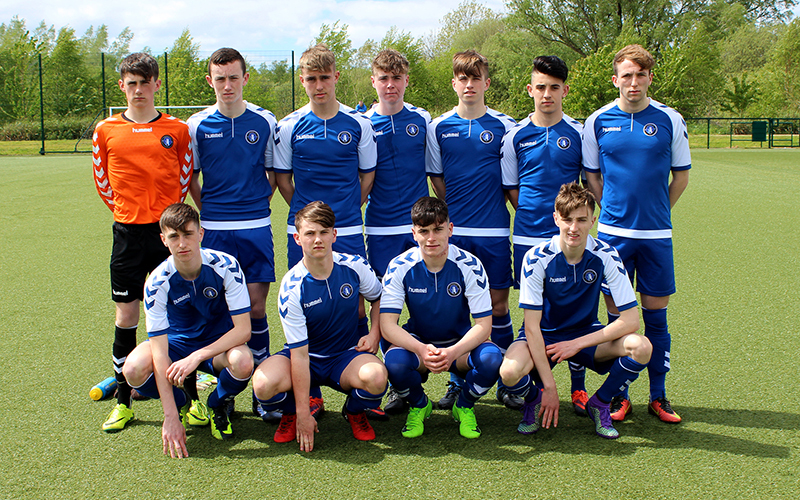 Under-17 Team v Cobh Ramblers: Back Row (L-R): Michael Garrihy, Lee Devitt, Michael Conlon, Liam O’Sullivan, Tomás O’Connor, Josh O’Rahilly, Andy Quaid. Front Row (L-R): Keith Ryan, Bradley McNamara, Philip Talty, Darragh Lowth. On 71 minutes, Kabia sent a free-kick from 20-yards just over, and two minutes later they went even closer when the striker curled a shot which seemed destined for the top corner only to crash back off the bar. But there was no denying them shortly after when Walls supplied a wonderful finish, finding the far top corner from the left angle of the area. Cobh looked to be in the ascendancy but Limerick restored their lead on 83 minutes when McNamara played a through-ball which Joyce powered to the net. The young Blues, though, were caught asleep from the restart with a pull-back finding Kabia who had a simple task to make it 2-2. Cobh should have been ahead on 88 minutes when a corner was flicked on but from inside the six-yard box Luke Quinn headed over. Lee Devitt’s cross was then met by a diving header from McNamara whose effort agonisingly went the wrong side of the upright. Limerick were lucky to survive in injury-time when Cobh were given too much space around the box and Kabia struck a low effort which came back off the post, as both sides were forced to settle for a point apiece. Limerick: Michael Garrihy, Andy Quaid, Keith Ryan, Tomás O’Connor, Josh O’Rahilly (Stephen Talty 66), Darragh Lowth, Liam O’Sullivan, Lee Devitt, Philip Talty (Dylan Kelly Higgins HT), Bradley McNamara, Michael Conlon (Jack Joyce 72). Goals: D Lowth (13 pen), J Joyce (83). Unused Subs: Cory McManus (GK), Tyrique McNamara. Cobh Ramblers: Arthur Nganou, Jack Turner, Nathan O’Donnell, Seán Hayes, Kyle Murphy, Cameron Harlson, Joe Meaney, Connor O’Leary ©, Jack Ford, Jaze Kabia, Loic Nguefang. Goals: D Walls (77), J Kabia (84). Bench: David Harrington, Luke Quinn, Jamie Gilmartin, Conor Walsh, Conor Drinan, Dylan Walls, Ross Slevin.